Maine Women Magazine is the only publication in Maine for, about and by Maine women. In the spring of 2016, we relaunched Maine Women Magazine as a full color, beautifully designed magazine for our 10-year anniversary. The results have been fabulous and we are so happy to have great features, columns, art, photos and more in each issue. 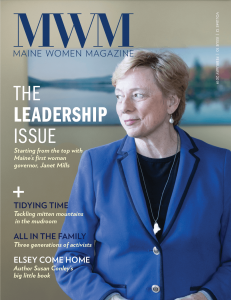 Maine Women Magazine is distributed throughout southern Maine. We look forward to building more content, more events, and telling more stories as we move ahead with our journey. Meet the women behind Maine Women Magazine! Don’t miss out on a single issue of MWM! Check out our Digital Editions here or have it delivered to your door every month by signing up for our subscription! Be apart of that reach. Contact us now to get more information about advertising opportunities.